I just read blog written by Greg Hinz on Crain's Chicago Business web site, talking about a new report issued by the Civic Committee of the Commercial Club of Chicago. This map illustrates this point. There were more schools added to the 2008 poorly performing schools list than taken off. Read the article that goes with this map, written by Mike Trakan from the T/MC. My hope is that business leaders will read some of the essays from the Tutor/Mentor Institute and apply these ideas in a strategy where they support what happens in the neighborhood, as well as what happens at a school. Our own voice is a small one. We're a tiny non profit, with limited dollars and a big vision. While we've been sending out this message over and over for 16 years, we've not had consistent funding to do this, or to send our message out with the reach and frequency of corporate advertising giants. Thus we're still a voice in the wilderness. However, if this voice rings true to you and your company, why not begin to form a team and investigate ways you can provide leadership that leads more kids to school prepared to learn and from school with networks helping them to jobs and careers. Here's a link to a press release on the City of Chicago web site showing the Mayor Announcing an $8 million donation by the Wallace Foundation For Citywide Support System for Teen Out-of-School-Time Programs Three Year Grant Will Connect Teens to Programs, Provide On-Line Access. There is no date on this but I believe it was two to three years ago. Here's the site which was built with that money. Here's the link to the Interactive Chicago Tutor/Mentor Program Locator which was first launched in 2004. The interactive mapping capacity was built over the past year. We've spent about $50,000 on this since 2004. The city service provides information on a wider range of youth programs, while the T/MC focuses on volunteer-based tutor/mentor programs. With the city version you can enter a zip code and find programs in that zip code. With the T/MC version you can zoom in and out of the map to not only find tutor/mentor programs in areas as small as a few blocks, based on type of program, and age group served, but you can also see assets such as banks, hospitals, universities, faith groups, etc. who could be helping to mobilize volunteers and donors to support the growth of tutor/mentor programs in different parts of the city. 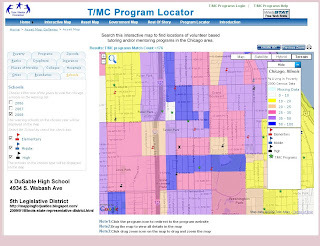 With the T/MC version you can also create poverty overlays, and school overlays, indicating where tutor/mentor programs are most needed in the city. With this tool, the Mayor, or any leader, can mobilize and point resources to all of the neighborhoods where kids need help, providing the aid and reinforcements that each program needs to provide effective services to youth. If it was worth $8 million for the city program locator, can a few donors dig in their pockets to provide $50,000 a year to support the Tutor/Mentor Program Locator? The Sunday, June 28 editorial in the Chicago Tribune was titled "Advancing education". It said "Illinois lawmakers and schools need to be pushed" and pointed to a new group called Advance Illinois, led by "heavy-hitters" such as former Governor Jim Edger and former U.S. Commerce Secretary Bill Daley (the Mayor's brother). I encourage people interested in education issues to visit this site and learn more from the information it provides. However, I also encourage you to visit the blog of George Siemens, who is an elearning innovator from Canada. In his article Siemens talks of "complex learning" and "problem solving"
I point to articles like this because solving the education crisis in Illinois and other states requires on-going learning by many citizens. It also invites the leaders of education reform to use some of the tools of the information world to help make their ideas and solutions easier to understand. For instance, I encourage the Tribune and groups like Advance Illinois, and the Illinois State Board of Education, to publish maps showing locations of poorly performing schools in the state, like we do on the Tutor/Mentor Program locator. Using maps we can begin to focus attention on the different reasons in different areas for why kids doing stay in school and how what happens in the community and the non-school hours influences these decisions. We can also look at the resources and assets in a neighborhood or a region, and mobilize more support from the private sector, faith groups, colleges and health care systems to support the social, emotional and economic reasons kids and families struggle, and why school in these areas also struggle. 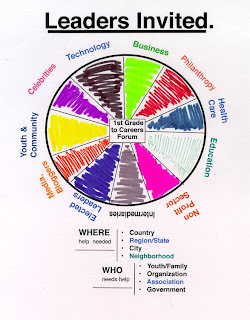 Using the internet, we can also create visualizations, or blueprints, which help more people see ways they can get involved in efforts that lead more kids through Illinois schools and into jobs. Such maps invite others to share this responsibility beyond teachers, administrators, parents, youth and elected officials. Much is written about Social Networking, but unless readers share this information in their networks, too few people will see these recommendations, and too few leaders in media, or business, will begin to apply these ideas into their own learning and leadership. Thus, I encourage you to pass this blog on to members of your network, just as I attempt to do. the High School Dropout Problem. (http://www.servicelearning.org/library/resource/8724), a report on the dropout crisis in American public education, Civic Enterprises has created a new report that includes the views of teachers and administrators, perspectives missing from its first report. This report has documented a mix of hopeful views and challenging statistics concerning how, and how well, those on the front lines of America's schools -- teachers and principals -- understand the nation's high school dropout crisis, including the ability for service-learning to be part of that solution. I read the executive summary of this report last night and it's a bit disturbing. First an awful lot of teachers don't think there is a "crisis" and many don't think that all kids can do the work needed to go to college. I think this deserves a lot of conversation because I've heard many in the manufacturing field say "colleges have us brainwashed" to believe that every kids must go to college. If we believe this we don't invest in high quality vocational education, or we look at that path to jobs as "less significant". I think the "politically correct" expectation is to say every kids can do college work. I'm not sure every kid wants to, or is motivated by that type of path. We should be preparing kids for different paths to jobs, and perhaps this report will stimulate some new thinking around this. I just read one of the current articles sent by Catalyst, Inc., titled THREE FRIENDS. It shows how the support of a principle, and a mentor provided by the Grand Boulevard Foundation, helped three young men stay in school and head to college. The article said "Outside funding brought in the mentor, Cornelius Ellen, who gave the boys hope by telling them that they could go to college—and proving that he was for real." "Ellen, however, faced the prospect of job-hunting. The Grand Boulevard Foundation grant that paid for his position had run out, and Dyett’s new principal, Robert McMiller, was still trying to find money in his budget to pick up Ellen’s salary. McMiller supports the school’s new approach. (Lemon left Dyett to become the principal of the new Chicago Talent Development High School slated to open this fall in West Garfield Park.)" What does this tell us? The money ran out so the mentor may no longer be in the school. The Principle moved to another school, so there is someone new who has to have the same commitment, for the same results to be repeated. If we don't enlist benefactors from the public, private, and business sector, to provide consistent funding so mentors and tutor/mentor programs are consistently available to kids, we can't expect to change the drop out problems, violence and other issues facing our inner cities. Visit Serve.Gov and you can see a video with First Lady Michelle Obama calling on Americans to get involved with summer service projects. If you've read many of my blogs about complex problems, strategic thinking, poverty, or innovation, you'll see that I don't think we'll change the lives of many inner city kids through short term volunteer involvement. If maps are not part of the leadership and mobilization of volunteers, we'll probably miss most of the places where volunteers are most needed. Thus, my hope is that this call for involvement will lead some companies, faith groups, civic and social organizations, etc. to form planning groups, where they review information about the root causes of the issues they care about, and begin to map strategies that would engage a growing number of people and resources in building solutions to those programs. I met this morning with the team at The Royal Order of Experience Design (or TRO) is a Chicago-based creative agency, who is doing exactly what I hope will take place in hundreds of places all over the country this summer. They are spending quality time thinking of ways to help people find and use the information on the T/MC web site. 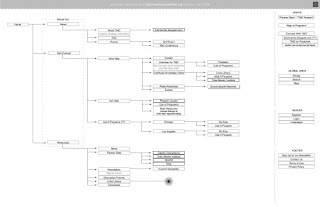 This graphic is a site map which you can see on their blog, which they created after many hours of mapping the information and navigation on the current site. If similar teams meet in different industries, and different cities, they can begin to think of ways to use their resources to mobilize volunteers to be part of tutor/mentor programs in Chicago and other cities as school starts this fall. They can innovate ways to help those volunteers stay involved throughout the coming school year. They can even innovate ways to help provide the operating dollars every tutor/mentor program needs to pay rent and insurance, do background checks and screen volunteers, and support students and volunteers with experienced staff. On the Tutor/Mentor Institute we have a number of essays that might support such thinking. If you're part of a team doing this kind of thinking, I hope you're drawing from the resources on the T/MC web sites, and using our maps to plan your distribution of impact. Why not share your ideas on a blog or web site so we and others can learn from you and the we can all create a greater impact than any of us can by working alone, or working for just a few months. Today's Chicago SunTimes reports that FBI statistics show residents near 55th and State had 1-in-4 chance of being victims of a violent crime between 2005 and 2007. If you look at the map on the SunTimes Web site you'll see that four Chicago neighborhoods are listed on the FBI top 25 list. 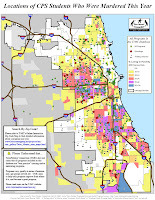 They are in the West and South parts of Chicago, which is where our maps show large concentrations of poverty, poor schools, and too few volunteer-based tutor/mentor programs. 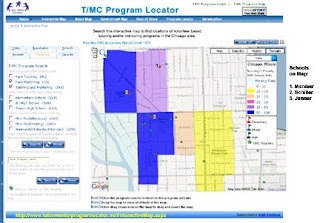 The map above was created using the Tutor/Mentor Program Locator's Interactive map. 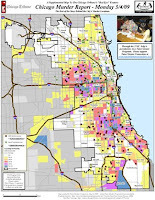 I zoomed in on the area highlighted in the SunTimes story, then added layers of information for poverty (20% or higher concentration), poorly performing schools, and organizations that offer various forms of volunteer-based tutoring and/or mentoring. I created a screen shot of the map that I had built, then pasted this into Adobe Photoshop. I cropped this, added some text and saved it as a JPG. All in less than 10 minutes. You can do the same thing to create your own map stories. While the National Conference on Volunteering and Service in San Francisco is encouraging American's to serve (see comment about Michelle Obama's speech), I encourage them to form learning circles, and use research and maps like we make available for Chicago, to learn where people need the most help, and to develop long-term strategies that not only put volunteers on the ground, but build an infrastructure that supports those volunteers in every location with safe facilities, well trained staff, innovative technology, and other resources needed for schools and non-school programs to become good, then great, at what they do to help end this violence by providing youth more positive alternatives. If you want to support the work the Tutor/Mentor Connection is doing, we need your dollars, and your talent. After the 2008 National Conference I wrote a series of blog articles, illustrating ways the business community can mobilize volunteers and resources to support the work of tutor/mentor programs in many locations. Few of these goals have yet been achieved, so I hope some people from the 2009 conference will read them and implement them in Chicago and other cities. This year's conference is using blogs and other social media to connect with people who cannot be at the conference. I'll be connecting from here and on http://www.twitter.com/tutormentorteam. As leaders talk about volunteering, I'll focus on the on-going operating support volunteer-based organizations require to achieve the goals of individuals and leaders from around the country. I'll point you to our Cabrini Connections and Tutor/Mentor Connection web sites, our maps, and other blogs that T/MC staff, and innovation leaders, are writing. Hopefully this expands your own library and network of ideas, and between now and the 2011 conference, you'll use these to help one or more tutor/mentor programs get the resources and ideas they need to stay connected to kids and keep volunteers involved. Here's one chart I hope you'll think about. It shows the goal of helping kids through school and into careers. On one end is business and industry, who need to be strategically involved in using their resources to support programs and provide activities that help more kids through school and into jobs. Here's another chart, which illustrates that we need leadership from every industry, not just one or two, so that dollars, and volunteers are flowing into every tutor/mentor program in a big city like Chicago, from every industry and social/civic sector. Chris Warren wrote some cause marketing blog articles last week that illustrate roles business can take. 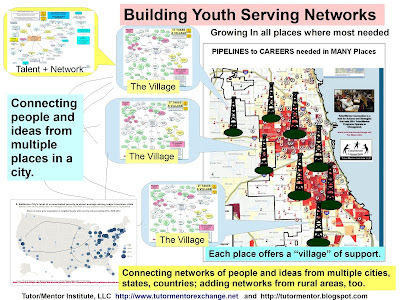 I hope some of those attending the National Conference will read these, and reach out to us with cause marketing strategies that help populate maps of Chicago with constantly improving, volunteer-based tutoring and/or mentoring programs. These articles and maps are intended to motivate, inspire, and lead people to actions that result in dollars flowing to non profits like Cabrini Connections. Read our fund raising blog and we'll add you and your company to the list if you send a donation or become a sponsor. Read the story on Chris Warren's blog. Chris works at the Tutor/Mentor Connection and is in the final month of a fellowship through the Northwestern University Public Interest Program. What's the strategy in NYC to fund the operations at the programs where mentors will connect with kids, this year, and in the next five years? 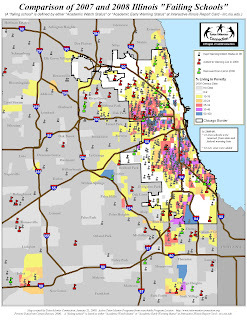 What would it take for leaders in Chicago, or another major city, to do this better? This week the Serve.gov web site announces the United We Serve campaign, intended to mobilize citizens to get involved in community problem solving. The introduction says "people can achieve extraordinary things when given the proper tools." "President Obama is asking us to come together to help lay a new foundation for growth. This initiative aims to both expand the impact of existing organizations by engaging new volunteers in their work and encourage volunteers to develop their own "do-it-yourself" projects." I found this photo showing troops that were landing on the Normandy Beach during D-Day. Think about what this photo illustrates, and compare that to the current mobilization of volunteers to do service. These troops had been training for months. This invasion was planned for years. The landing craft were being built years be for the invasion because it was anticipated that they would be needed. The solders were well armed, well fed, and led by well trained leaders. That costs money. Lots of money. There are lots of ways volunteers can do service. Some projects, like cleaning up a park, or building a house, might take a day, or several weeks. However, these are short term. 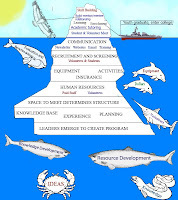 Other projects, like tutoring/mentoring require more consistent, long-term involvement, if the benefit is that the youth being tutored/mentored has overcome his own learning difficulties, and the negative influences of his family or community which might be modeling examples and behaviors that don't lead to high school graduation, college or productive jobs and careers. In both cases, volunteers time is well spent when there are leaders who have the experience to organize their efforts, and support their involvement. Sending volunteers into organizations which don't have this leadership is like sending troops onto a beach without rifles or bullets. I was a member of the Chicago delegation to the 1997 President's Summit for America's Future, which pledged support for the 15 million kids in America who were being left behind because they lived in high poverty. Lots of great rhetoric and patriotic speeches were given. Read this one by General Powell, President Clinton and others that shows the vision behind the Summit. The problem was, not one was thinking of the infrastructure needed across America, and in the neighborhoods where these 15 millions kids were living, which would support this flood of new volunteers, and keep them engaged for the many years it takes to help a first grader living in a high poverty neighborhood become a 12th grader graduating from high school and headed for college or a job. I remember sitting in a meeting following the Summit, with a business leader sitting next to me. When I asked about the money needed to support added volunteers, I was told "we're focusing on volunteers, not philanthropy." You cannot have good volunteerism without good philanthropy! And in today's economy, when many of the small non profits who are working with inner city kids are struggling to find operating dollars to keep existing staff employed, how can you expect them to ramp up programs to support more volunteers in significant efforts that can lead to a victory over poverty? There's still time for the president to use his bully pulpit to call on faith leaders, business leaders, civic and social groups, to reach out to volunteer based organizations like Cabrini Connections, with flexible operating dollars that they need to pay the rent, insurance and staff expenses. 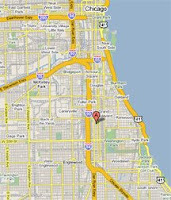 Visit the Chicago Tutor/Mentor Program Locator and you can find links to many similar programs serving Chicago. Become a volunteer if you want, but help bring dollars to support your involvement at the same time. We can make sure that when these volunteers hit the beach they succeed, and they stay involved until we win this war. Chris Warren from my staff has been working with a Chicago-based events company called Pallandrome. I encourage you to read the article he writes about Cause Marketing and a September Sunday Funday event. In today's SunTimes there was a letter signed by Christine Radogno and Tom Cross, Republican Leaders of the Illinois Senate and House. The argument was that political districts should not be constructed to meet special interest needs, or keep politicians in office. 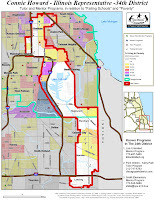 Here's an map of the 1st Aldermanic Ward in Chicago. Does this look like it's been designed for a special purpose? This is the 34th Legislative District. If you'd like to see the shapes of all of the Illinois Senate and House districts covering the Chicago area, look at the maps on our new Program Locator. These maps go beyond showing the boundaries of the district. They show the levels of poverty and poorly performing schools. They also show any volunteer-based tutoring and/or mentoring programs that we have on our database. Furthermore, they show businesses, faith groups, hospitals and universities who might be mobilized by the elected leader to help kids in the district stay safe in non-school hours, stay in school through high school graduation, and be starting jobs and careers by their mid 20s. If your elected representative is helping such programs grow in your district, make sure you vote for him again, regardless of the shape of the boundaries. I created this graphic to illustrate the work done behind the scenes at Cabrini Connection, which leads to on-going connections of youth and volunteers in our program at 800 W. Huron. There are dozens of things to focus on every day, and too few people to do everything well. In this strategy map, I focus on actions by people in businesses, faith groups, politics, etc. that would lead to programs like Cabrini Connections reaching k-12 youth in every high poverty neighborhood of Chicago, and every other big city in the country. That's an even larger challenge than building and sustaining a single program in one neighborhood. In my outreach I'm constantly trying to nurture the growth of teams in universities, businesses, hospitals and professional groups, who would take ownership of this strategy, using their own time, talent and dollars. The essays in this section of the Tutor/Mentor Institute are intended to stimulate such thinking. However, this is abstract. How does one get such a group started? Thus, I'm pleased to point to a new blog I've added to my blog links. It's The Royal Order, written by people working in a technology/web development firm in Chicago, who are using their time and talent to help us improve what we do. This is a new initiative, and only the future will show what has happened as a result of this team doing this work. However, if others look at this and try to duplicate this effort, we can have multiple teams doing similar work, resulting in a flow of volunteers and donors from many sectors to support Cabrini Connections and every other tutor/mentor program in Chicago, and in other cities. Visit the Groups section of our ning site and you can see examples of other groups that we're nurturing toward this same goal. Form your own group. Share you own blog articles. As each group learns from each other, we'll see a constant innovation of improvement, based on what we each learn and how we inspire each other. The beneficiary will be the kids, and the volunteers who get involved. Today's Chicago Tribune featured a column by Mary Schmich, talking about the coming merger of two elementary schools serving the Cabrini Green area of Chicago. I've known Mary for many years and she has written many columns on the past about the challenges of living in Cabrini Green, and even about the work we do to mobilize volunteers to help inner city kids overcome those challenges. I've been leading a tutor/mentor program connecting Cabrini Green youth with tutors/mentors for more than 30 years. 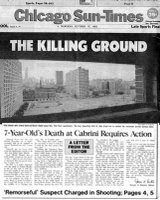 I started Cabrini Connections and the Tutor/Mentor Connection in 1993, following the shooting of 7 year old Dantrell Davis in October 1992. Some of our kids attend Jenner School then go on to area high schools. I know these kids well. In her column Schmich says "Jenner lies on the south side of Division Street, Schiller on the north. Students on either side cross with a sense of peril." This map, created with the new interactive Tutor/Mentor Program Locator shows the locations of Shiller and Jenner Schools, with overlays showing poverty demographics, in the Cabrini Green neighborhood. You can create your own version of this map if you visit this link. She goes on to say, "Cabrini may be vanishing, and many of the displaced students may commute to school here from far parts of the city, but gang rivalries and assorted resentments continue to be handed down like family recipies." She interviewed a teacher at Jenner who is trying to build harmony between the new students from Schiller and the current students at Jenner. She quotes a teacher who says "The students are on a shrinking iceberg". Schmich wrote, "When this teacher asked kids to list potential problems of the merger of two schools one student responded, 'Fighting. Guns. Disrespect. Arguing. No Friends. New teachers. Bad feelings." I believe in non-school tutor/mentor programs because they offer a place during the non-school hours where kids can meet, and be supported by extra adults beyond the family. We held our annual year end dinner on June 4, and a video was shown, in which two students interview their parents, who talk about the value of Cabrini Connections. View it here. Schmich is a great writer, and I'm glad she pays attention to what is going on in Cabrini Green. However, I just wish she and other writers would talk about programs like Cabrini Connections who are working to help these kids, but who are limited in their ability because they constantly struggle for operating dollars. The story could have gone on to talk about ways tutor/mentor programs are trying to help kids in Cabrini, but are struggling because many people don't think the neighborhood still has kids who need our help. The article shows that kids from Schiller and Jenner are still dealing with poverty. The video from our year end dinner hows that parents feel we're a value to their kids. In addition, the reporter could have used the Tutor/Mentor Program Locator to create a map image as I did. Anyone reading the story could search the Program Locator to determine the need for tutor/mentor programs in different areas of the city, and to find programs that exist in these areas. There are thousands of people in Chicago who might support programs like Cabrini Connections, but unless reporters and media show us as one solution to the challenges kids face, too few people will know we exist, and too few will support us. We don't have the advertising dollars to get this story out as often as it needs to be heard. Thus, if you are reading this, pass it on. Ask people you know to send donations to Cabrini Connections, or to other tutor/mentor programs operating in other neighborhoods, who are just as isolated, and just as in need of funding. Parents value our services. In addition, if you appreciate what we're trying to do with the maps and Program Locator, please provide some funds to help us keep developing this resource. The demographics of the city are changing and with each Census, we need to update these maps so they are as accurate as possible. We cannot do that without funds to pay for the staff who do this work. If you'd like to help call us at 312-492-9614. If tutor/mentor programs are to remain in places where they are needed, it will be because private sector leaders have stepped forward with their own time, talent and dollars to help us do this work. 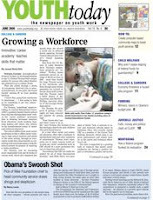 The front cover of the June 2009 issue of Youth Today includes a map showing the Tutor/Mentor Connection created to show how elected leaders and faith leaders can mobilize private sector resources to support the growth of volunteer based tutor/mentor programs in their own district or neighborhood. 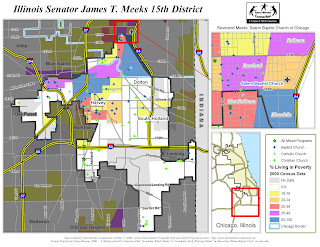 The map on the Youth Today front cover shows the Illinois State Senate district represented by the Rev. James Meeks, who is also leader of the powerful Salem Baptist Church. You can see this map, and an article we wrote illustrating how Rev. Meeks and other leader can use these maps, in this blog article. 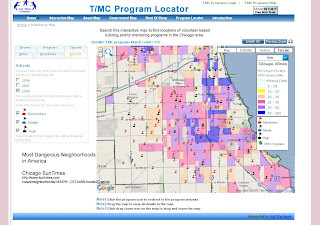 You can also see the same map on the home page of the T/MC's interactive Program Locator, which can be used by anyone in the Chicago region to build strategies that mobilize resources to help non-school tutor/mentor programs grow in different parts of the city or suburbs. The mapping done by the Tutor/Mentor Connection since January 2008 is the result of a $50,000 donation provide by an anonymous donor in late 2007. That money has been spent to build the T/MC map library and this interactive map. If you're a business or philanthropy, and you value how this resource can be used by anyone who wants to end poverty by helping kids have non-school tutor/mentor support networks in their neighborhood, please become the next benefactor to provide the dollars we need to do this work. Your contribution can be large, or it can be small. However, it's needed now in order for us to sustain this service. You can make donations here, or send them to Cabrini Connections, Tutor/Mentor Connection, 800 W. Huron, Chicago, Il. 60642. See our board list, annual report, and organizational history here. This map was on the front page of the June 2009 issue of YOUTH Today, the newspaper on youth work. It was part of a set of stories showing how youth organizations are using maps to draw attention to social services groups in different cities. The link on the YouthToday site is here, but you need to register to view it. Take a look at the Tutor/Mentor Program Locator. We built this, and our entire mapping strategy, over the past year with the help of an anonymous donor who provided $50,000 in fall 2007. Now we're looking for another benefactor who will fund our continued innovation and operation of the tutor/mentor program locator for the next few years. 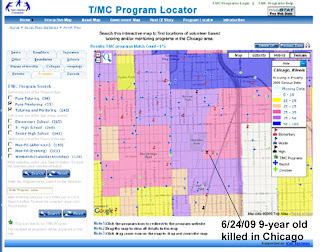 This service not only requires the ability to create these maps, and support the interactive technology, but also requires us to contact all of the tutor/mentor programs in the Chicago region on a regular basis to make sure our data is current, and to show them how to use this service. We don't expect government funding for this, because we're innovating into the unknown as we create this service. We need the type of donor who would fund this type of effort, with flexible dollars, based on the purpose and the potential. If you know of a donor, or benefactor, who would support this, please introduce us. If you're in another city and want this service, we can give it to you at no cost, if you can help us find the donors who we need to provide the service. Today's page 2 headline in the Chicago SunTimes was "This is not the Wild, Wild West" which was a quote from Chicago Police Superintendent Jody Wies following a shooting in broad daylight that left one young man dead, and another wounded. 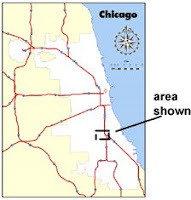 This map shows where DuSable High School is located in the South part of Chicago, just Northwest of the affluent Hyde Park neighborhood. On the Interactive maps, we can show assets in the area, such as businesses, faith groups, universities, who could be working pro-actively to help tutor/mentor programs grow in this area. 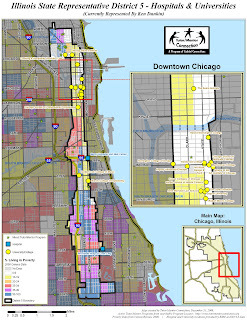 Our map shows only one small program near the DuSable Academy, operating at a branch library. Our interactive maps can also show political districts, so we see that DuSable Leadership Academy is in the 5th Legislative District, which runs from the Cabrini Green area in the North Loop, all the way South to include this high school. We created a set of maps for this district and posted them on our MappingforJustice blog back in January. I even sent a copy to Ken Dunkin, the representative for the 5th District. On the TV news last night, I heard one parent say "kids need more mentoring" to build positive habits and avoid gangs. If there are no programs in the district where that is happening, and if our leaders are not working to make such programs available, we'll keep seeing headlines like this. I wrote an article after another shooting, titled ENOUGH is ENOUGH I hope that our elected leaders, media, business and faith leaders will take some time to read it, then incorporate these ideas, and our maps, into their own leadership. 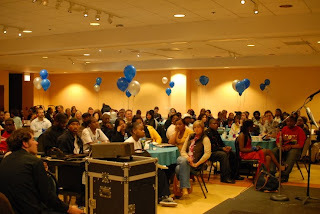 More than 200 people attended last night's Cabrini Connections year end dinner. It was a fun time for all. Today as I went to Facebook I found that some of the alumni who had attended were already sharing stories with others. I encourage you to read what Tawanna Blake had to say. She starts her message with "Today I went to the Cabrini Green Connection Tutoring Program Year End Dinner. It was an amazing opportunity to see so many youths, who were impacted by so many positive individuals who are willing to commit and give their time and effort to a great cause. " Our aim is to connect you to workplace volunteers and try to keep them connected for as long as possible so that both the youth, and the volunteer, are transformed as a result of this shared experience. You can find photos from the dinner here and here. We'll be posting more articles and photos on the Cabrini Blog in the next few days. Thanks for everyone who helped make this 2008-09 school year possible. We need your help to do this again in the comming year. In the June 4 Chicago SunTimes, Richard Roeper's column provides a sad story about how poverty turned a smart 8-year old kid into inmate#84433 in an Illinois jail. Roeper wrote about this 8 year old boy in 1995, based on an entry from the little boy's journal which said "I feel bad that people are killing people. I hate that people don't care about kids or grown-ups, because we want to live our life saying, 'I love my life'." We were in the second year of Cabrini Connections and the Tutor/Mentor Connection at that time, and I was just beginning to use maps to show where these stories were taking place. My purpose was to follow up media stories with what I call "The Rest of the Story", showing the poverty in the neighborhood, and drawing attention, volunteers and resources to any tutor/mentor programs operating in the area. 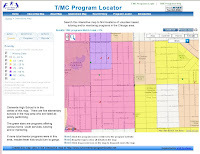 The map above was created using the new, interactive tutor/mentor program locator. I was able to zoom into the area around Clemente High School, and show the number of elementary schools in the area who are on state warning lists, as well as the level of poverty. On this map the green stars are groups offering various forms of tutoring and/or mentoring. On the interactive map, you can click on the star and find contact information. If they have a web site, you can go to the web site and learn what this groups does to help kids, and how you can use your time and talent and dollars to help. Unfortunately, this neighborhood has too few tutor/mentor programs, and we've not had a lot of success creating these maps, or getting the media and business advertisers to draw attention to volunteer-based tutoring/mentoring over the years. Tonight we're hosting our 16th year end dinner for Cabrini Connections. We'll have more than 200 parents, students, volunteers and alumni at the event. We'll celebrate the work of the past year, and the graduation of five of our seniors. If programs like this were in the area around Clemente High School for the past 14 years, maybe the letter Roeper received would have been different. If Chicagoans want different outcomes for inner city kids, they need to provide the time, talent, and flexible operating dollars to make such programs available, and to keep them in place year after year. If other cities want these types of programs they need to create a Tutor/Mentor Connection, and a support system for all of their neighborhood programs. Over the past few years a growing number of students, and alumni, of Northwestern University have become involved with Cabrini Connections, Tutor/Mentor Connection. I encourage you to meet Diana, Chris, Nicole and El Da'Sheon, as well as our Campus Catalyst team, on the NUTutorMentor Ning site. Our aim is that this site become a "dream place" where more and more members of the NU family join with us in efforts that unleash their time, talent and financial resources of the university and its alumni to help kids in all of the poverty areas on these maps get the tutor/mentor support they need to move through high school, to colleges like NU, then to careers in companies led by alumni. If you're a NU student, or alumni, or on the faculty or in the administration, I hope you'll join this community. If you're from another university, I hope we can help you form a similar community for the same purpose. I write this blog with the hope of sharing dreams with others who will work with Cabrini Connections and the Tutor/Mentor Connection to help inner city kids move through school and into jobs and careers. While I know that between 1,000 and 1500 visitors come to this site each month, I don't know how that compares with other non profit blogs. However, a List of Change blog has been created, which shows which blogs are having the greatest impact. Over 200 blogs are on the site, and this one tied for 30th on the list. In most of these blogs, I share information, and I share dreams. My hope is to inspire volunteers, donors, political leaders and others to be more strategic in how they support tutor/mentor programs, so we can be more effective in how we inspire kids to learn, and support them as they move through school. Last weekend we hosted a 2 day conference in Chicago, which brings people together to share ideas and network. Nicole White, from my staff, has been part of the last five conferences, and organized the last two. I encourage you to read what she wrote this week. Nicole started with us as a Northwestern University Public Interest intern two years ago. Last year Chris Warren took this role. Chris has added a new dimension of 'story telling' to our work this year. I encourage you to read this article about how he and students from our leadership council, and other volunteers, created a new video for the year end dinner. On Saturday, as I was running to the bank to deposit money to pay our bills, I met a new tenet in the 800 W. Huron building where we operate. We started talking and he introduced me to a book titled The Dream Manager, written by Matthew Kelly. As we talked I realized how much we at Cabrini Connections, and the Tutor/Mentor Connection are all about helping young people achieve their dreams. From reading this book, and attending a session hosted by The Dream Manager team in Chicago today, my thinking has gone to another level. We need to also be thinking about how we help the parents of our kids, and our volunteers, staff, family members, and ourselves, achieve our own dreams. We need to learn what the dreams are of our donors, and and our alumni. We all have dreams. We can help each other express those dreams, and achieve them. In doing so we can make the Dream of Dr. Martin Luther King, Jr. more of a reality than it has ever been in the past. This is a video created by teens and volunteers of the Cabrini Connections tutor/mentor program in Chicago. 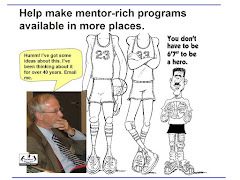 The Tutor/Mentor Connection was originally the collection of ideas I used to lead a tutor/mentor program in Chicago from 1975 to 1992. When we formed Cabrini Connections in 1993 we said "let's share what we have learned, and what others have learned, to help similar programs operate in all high poverty areas. This video is an example of what type of learning can take place in a non-school tutor/mentor program. Three of the participants of the May 28 and 29 conference were interns from the Illinois Institute of Technology who have joined us for a six week internships.